Defrost the frozen spinach and squeeze out ALL excess liquid. Put the spinach, ricotta, parmesan, flour and egg in the food processor and pulse until well combined. Plop the dough in one pile on a floured cutting board. Sprinkle more flour on top until the dough no longer sticks to your hands. Divide into 3 or 4 pieces and roll each one into a thin log about 1-inch in diameter. Cut the logs into 1 to 1 ½” sized chunks and toss with a little more flour. Bring a large pot of water to a boil and slide in the pieces of dough. Cook until all are floating and done all the way through when cut in half, about 3 to 5 minutes. Drain and toss with salt and pepper, to taste. Serve with either a high quality store bought tomato sauce or a homemade one. My daughter has an egg allergy. How could I adapt this so she can eat it too? Hi there. We’ve not made it without egg but vegan sites add a tablespoon of oil it its place. Do you think a “flax seed egg” would work? I have used that in other recipes before. We’ve not tried using a flax egg in pasta. We used a tablespoon of oil instead of egg and it worked! Fresh spinach would result in too much liquid when cooked. The dough would likely fall apart. Ah good to know. Thanks! 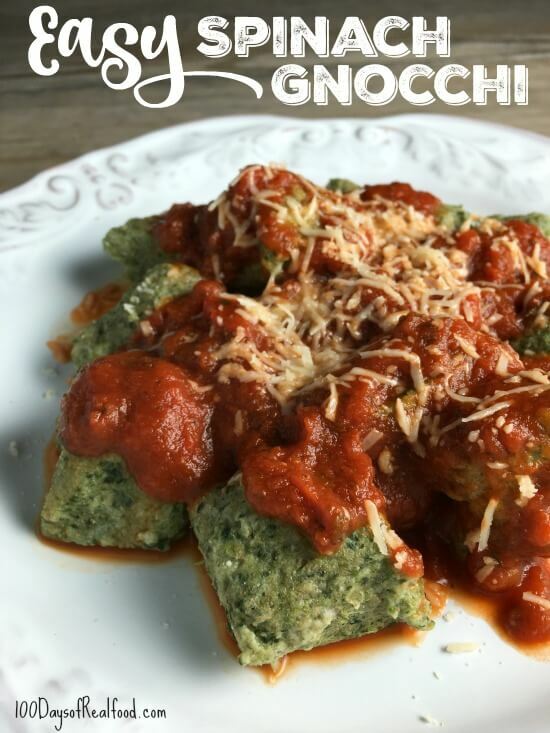 I tried this recipe with frozen spinach the other day and it turned out pretty well. There was a very intense whole wheat taste but the gnocchi tasted better the second day after sititng in the fridge. I love spinach gnocchi, but don’t have a food processor while living abroad… would vigorous mixing with a spoon suffice in this case? Thanks much for sharing, can’t wait to try this recipe with or without the processor! We used an electric mixer with good results. I think you could vigorously mix with a spoon. The spinach won’t get ground up, but ours didn’t either, and it was fine. For the non-cooks among us, it seems like a step is missing…In Step Two, where did the dough come from? The food processor mixes it. Do you ever use gluten free flour in your recipes? So many sound delicious but impossible to make since I have celiac. Hi Melissa. I often sub gluten free flour in many of Lisa’s recipes. Most have turned out really well. Oh great to know! Thank you!! Can these be frozen for future use prior to boiling? Wondering if I made a double batch… could I freeze half? I have not tried it myself, but I do think it would work – let me know how it goes! I am so excited to try this recipe! 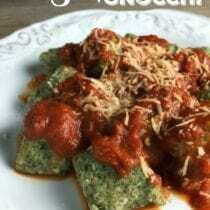 My daughter is a full-fledged ravioli addict, and I’m hoping this might be similar enough to win her over. I’ll call it “ravioli filling”! Do these recipes get added to the index on-line? I use that index all of the time for new ideas. It would be great if these additions could get added to it as well. I’m loving this!!! HI Sue. Yes, all of Lisa’s recipes that she shares on the blog will be added to the index. Made this 2 nights ago! My husband was impressed, and my girls loved it!! Can you substitute for another type of flour? Almond flour perhaps, chickpea, coconut? So far this is a big mess. Even after an additional cup of flour it sticking to my hands and the board. We’ll see how it tastes. you have to handle the dough as little as possible. Also…The water should not be at a full boil or they will fall apart. Even after they are in the water the flame should be low. Leave out the egg. Not needed. My husband is not a ricotta cheese fan. Does anyone have an idea of what to use instead? I usually substitute cottage cheese for ricotta when I make lasagna. It might need to be drained a little to get the same texture. These looks so good and simple! Can’t wait to give them a try! Beautiful and they look really delicious! This recipe was delicious. It will be on repeat in my kitchen for sure. Made this for dinner last night and it was delicious. In the words of my 9 year old, “you can’t even taste the spinach”. Mind you she likes spinach, but I am always looking for ways to get more greens into our diet. I made a batch and a third to feed our family of five and served it with homemade vodka sauce. This looks delicious, but mine came out really tough and wheaty. I ended up adding a lot of extra flour so that I could successfully roll the dough and cut it into pieces, because my dough was wet and sticky and hard to work with. Thoughts? I would like to give it another try! I love your recipes! Hi there. You might have just gone a little heavy with the additional flour. You could always try the white whole wheat as well. Can you recommend your favorite food processor? I don’t care for mine. Hi Sarah. This is Lisa’s: http://www.amazon.com/gp/product/B01AXM4SB6/ref=as_li_qf_sp_asin_il_tl?ie=UTF8&camp=1789&creative=9325&creativeASIN=B01AXM4SB6&linkCode=as2&tag=100dayofreafo-20&linkId=4DHDKKBEF2KPHRCV. How many ounces of Parmesean do you use? The grate size can make a huge difference in how much is in 3/4 cup. Thanks in advance! Hi. I use a fine grade. Great recipe! SO much easier than potato gnocchi, tasted good, and was easy for my 1 year old to eat. Thanks for posting this! How much is considered “one serving?” 1 cup? Yes, 1 cup would be a standard serving. Can you make this with gluten free flour? Hi. We have not tried, sorry.